In 1906 a group of Chicago businessmen commissioned architect and urban designer Daniel Burnham to bring order and beauty to their fast-growing, filthy, and congested Midwest city. Burnham, the visionary behind the city’s 1893 World’s Columbian Exposition, proposed a plan nicknamed “Paris on the Prairie”—grand boulevards cutting through a simple grid, leading citizens to plazas and parks. Today, when Chicagoans and tourists stroll along Lake Michigan or the Magnificent Mile, or when they board an Amtrak at Union Station, or when they spin on the merry-go-round at Navy Pier, they are enjoying the fruits of Burnham’s plan. Chicago, thanks to Burnham, is an intentional city. Atlanta is not. For much of its history, the city has been shaped by parochial interests, political expediency, and the whims of developers. Tim Keane knew before he left Charleston in 2015 to become Atlanta’s planning commissioner that the city was roaring ahead without a vision. He came anyway. Why? “Atlanta has an opportunity over the next 25 years to completely shift [its] way of developing,” he says. “But we will not be successful if we don’t have a design.” City Hall projections show that the city’s population could almost triple by 2050. Atlanta, Keane says, needs a master vision to guide the city as it stretches to accommodate new and existing residents. 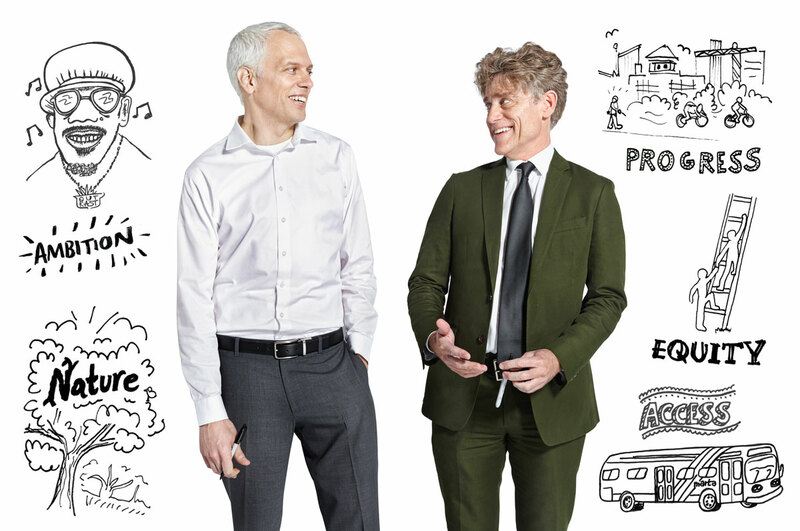 For the past 17 months, he and Ryan Gravel, the urban designer who came up with the idea for the Atlanta BeltLine, have been working on something called the City Design Project, a kind of overarching vision for how the city should look and feel in the coming decades. To Gravel, a child of the auto-centric suburbs whose idea for the BeltLine forever changed intown’s development pattern, the challenge of designing Atlanta’s future was a “dream job.” And he found a fellow traveler in Keane, whose bold ideas about urbanism have earned him goodwill from planning, transit, and development communities. Gravel canvassed community leaders, but also relied on his own daydreams, fleshing them out into concepts that were tweaked by two urban designers at a pop-up studio at Ponce City Market. Keane worked City Hall, briefing department heads on how they could integrate the vision into their projects. The two hosted community meetings to collect input. Every Thursday they’d meet at the studio to discuss progress. Five core values—equity, progress, ambition, nature, and access—emerged, which Keane and Gravel believe should guide all future city plans. Density would be concentrated in downtown, Midtown, and Buckhead “skyline zones,” with some high-rises even higher than today’s skyscrapers, and in smaller scale along the edges of single-family neighborhoods. Plazas and parks could help tame hectic intown thoroughfares—Peachtree Road between Brookwood and Buckhead Village, for example—and encourage walking. The lush tree canopy in southwest Atlanta and parts of northeast Atlanta would remain verdant, buttressed by two “anchor” parks comprising thousands of acres along the Chattahoochee River and the overlooked South River straddling Fulton and DeKalb counties. Bike paths along ridge lines, safer streets, and “eco trails” would bring together communities that have long been separated by wide roads, railroads, and bad development. New transit on Atlanta’s suburban-style far west side would boost access to jobs. Over the next year, Keane and Gravel say, the project will start to take shape as its findings guide plans covering transportation, urban ecology, and housing—as well as the multiyear overhaul of the city’s zoning code, which has not been updated since the early 1980s. The latter could offer the city an opportunity to ax policies that keep people in their cars, which Chris Carter, the founding partner in Vantage Realty, says enables Atlanta’s automobile addiction and hinders smarter development. “The only way to pull off the plan they’re coming up with is to eliminate the city’s parking requirements in urban areas,” Carter says. Developers will also have to convince lenders who bankroll new housing and retail that a less auto-oriented Atlanta is possible. It’s not an all-or-nothing proposition. Chicago, after all, built just 25 percent of the Burnham Plan in the end. But Chicago dared to dream about what it would become and, in doing so, established what Keane calls a “true urban identity.” Now Atlanta may get to do the same. Provide opportunities to help the next Outkast find its voice. Accentuate Atlanta’s lush tree canopy and waterways. Plan for pedestrians, bicyclists, and transit users—not just cars. Population growth can benefit the city and solve issues like affordability. How does everyone participate in Atlanta’s prosperity?